The national recommendation to undertake three admission screens each separated by 48 hours to confirm a negative CPE carriage status (combined with pre-emptive isolation) are ‘out there’ so far as recommendations go. I think I can understand where this recommendation came from. Whilst it is not, to my knowledge, evidence-based (there are no references in the Toolkit itself which support it), I suspect it came about as a conservative approach to address what was perceived as a rare but emerging threat, and that the proposed admission screening process would have been enacted on only a small group of patients in most settings. However, in our hospitals, where something like 40% of all admissions are screened for CPE on admission, following this recommendation to the letter is impossible because the pre-emptive isolation aspect is simply not feasible. However, we did launch our new screening policy in 2015 with the recommendation to take three screens each separated by 48 hours to confirm a negative carriage status at the time of admission. So this gave us the opportunity to perform this study and provide some evidence to support or challenge the recommendation. About 20,000 rectal screens from about 10,000 patients were analysed over a 6 month period in 2015. During this time, patients were screened for CPE if they were overseas residents or had a history of overnight hospitalisation in any hospital in the past 12 months (including our own readmissions). In addition, universal screening was in operation in the ICU, renal, vascular and haematology in-patient wards. Weekly screening of all inpatients occurred on these wards, and on any ward where a known CPE carrier was present, which continued for four weeks after the transfer or discharge of the patient. Finally, CPE screening was also performed on contacts of newly identified cases. 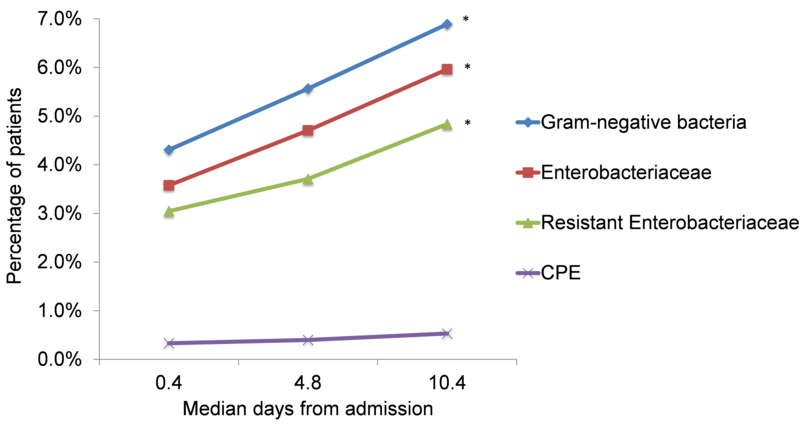 We evaluated the rate of CPE and other resistant Gram-negative bacteria carriage in patients who received three screens on admission each separated by 48 hours. Only 221 of the 9,514 patients admitted during this period actually received all three admission screens in the correct timeframe, and none of these carried CPE. In other words, we failed to implement the serial admission screening recommendation effectively. Of the patients who did not receive the serial admission screens, one third didn’t stay long enough to do so, and two thirds stayed long enough, but just didn’t get screened at the right timepoints. Discussions with staff about these challenges revealed difficulties in identifying when a repeat screen was due, patient bed movements in and between wards and to other procedures (e.g. surgery), and a reluctance to re-screen patients when the final result for the first result was not available, which could be classed as subjecting patients to an unnecessary additional test. We also evaluated the rate of carriage of CPE and other resistant Gram-negative bacteria in the 1509 patients who received three screens for CPE at any point in a single admission. Whilst the first screen in this set of three would have been an admission screen in most case, the other two screens would have been a mixture of repeated admission screens, routine weekly screens, and screens triggered by contact tracing. In this dataset, whilst there was no increase in the rate of carriage of CPE, there was a marked and progressive increase in the rate of carriage of the other groups of resistant Gram-negative bacteria included in the study (Figure 1). Figure 1: The rate of carriage of CPE and other resistant Gram-negative bacteria in 1509 patients who received three screens during one admission. * = p<0.05 when analysed using repeated measure logistic regression. We analysed the carriage rate of four different groups that grew on the selective agar; since they grew of selective agar, they are all resistant Gram-negative bacteria (to a lesser or greater degree). So why the apparent increase in the rate of carriage of resistant Gram-negative bacteria? We figured there are two possible explanations: either unmasking of pre-existing carriage due to various exposures (e.g. antibiotics, changes in diet), or acquisition of more resistant gut flora. Whilst this question would need a specifically designed study to answer, the fact that the majority of patients who were CPE-negative on an initial screen and subsequently had a screen growing CPE were linked to known outbreaks argues more for in-hospital acquisition than for unmasking. Whilst we acknowledge that this isn’t the perfect dataset to answer the question about whether or not to perform serial admission screens for CPE (since so few patients actually received the three screens at the specified timepoints), we concluded that this study provides sufficient evidence to overturn the non-evidence-based national recommendation in our setting, balancing risk and resource. So, on the basis of these findings, we now perform a single screen for CPE admission screening and contact tracing. However, our findings very much support repeated screens of long-stay patients – and further work is required to understand the apparent increase in carriage of resistant Gram-negative bacteria throughout the early days of hospitalisation in this group of patients. Congratulations. This study demonstates that rectal carriage with antibiotic resistant Enterobacteriaceae in your patient population is actually lower than in ours (UMC Utrecht, the Netherlands), despite the obvious bias that you included high-risk patients (where we did not).